This stylish ottoman serves double duty in your seating group. Perfectly proportioned for pairing with the coordinating chair, the ottoman's wide seat comfortably supports your legs and feet. The ottoman even doubles as additional seating when entertaining guests. Tapered wood feet and welt cord-trimmed seats complete the ottoman's updated style. The 103A Contemporary Ottoman with Tapered Legs by Bauhaus at AHFA in the area. Product availability may vary. Contact us for the most current availability on this product. Fabric Options Available in an array of upholstery coverings in assorted colors. Seat Support Sinuous spring system and double springing on each end to ensure an even seat. Padding & Ergonomics Frames are well padded both inside and out to protect the fabric and provide a more tailored look. Cushions are 1.8 foam Dacron wrapped to ensure comfort. Warranty Frames have a limited lifetime warranty. This stylish upholstery collection features a slightly more laidback take on contemporary design. 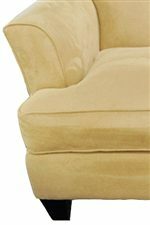 Chic flair tapered arms, tight seat backs and plush cushions trimmed with welt cords provide an optimal balance of comfort and style. Tapered wood feet and coordinating toss pillows complete the modern yet livable style of this sofa, love seat, chair and ottoman set. Available in an array of upholstery coverings in your choice of colors. The 103A collection is a great option if you are looking for Contemporary furniture in the area. Browse other items in the 103A collection from AHFA in the area.